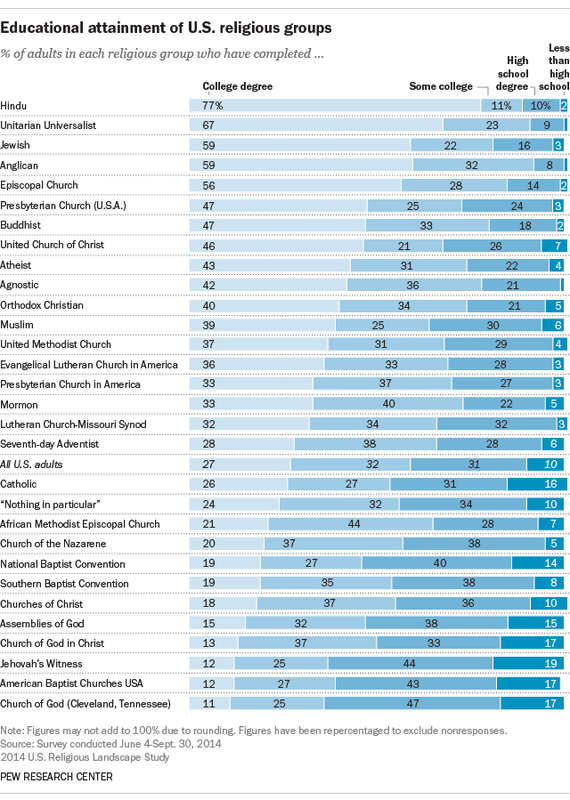 These groups are among the top of a list of 30 U.S. religious groups ranked by educational attainment based on data from our 2014 Religious Landscape Study. Given the strong correlation between educational attainment and economic success, it is not surprising that Jews and Hindus, on average, have high household incomes, with four-in-ten Jews (44%) and roughly a third of Hindus (36%) living in households with annual incomes of at least $100,000, according to the 2014 study. Other religious groups also have a higher percentage of college graduates than the full sample of more than 35,000 U.S. adults surveyed in the 2014 Religious Landscape Study, among whom 27% completed university. They include Buddhists and members of the Presbyterian Church (U.S.A.) – both at 47% – as well as Orthodox Christians (40%), Muslims (39%) and Mormons (33%). Since Catholics make up one-in-five adults, it is not surprising that their share of members with a college degree (26%) roughly mirrors that of the general public.